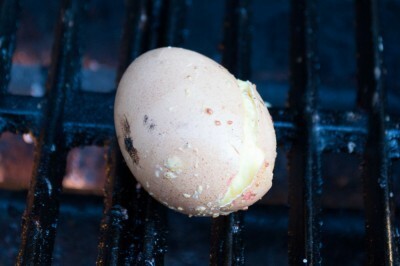 Spin some eggs, brush on oil, put the eggs on the grill. Set the grill to the lowest flame setting and close the lid for 10 minutes. Open periodically to control the heat so they don’t explode or crack before they are cooked. It’s ok if they crack after the meat is cooked a bit because they won’t ooze at that point. You might even encourage a little cracking to smoke the egg a bit!